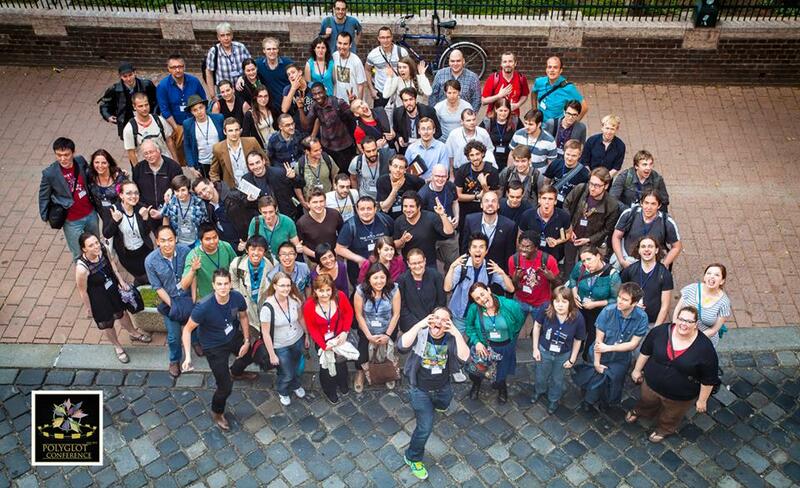 Last month I had the privilege to speak at the very first Polyglot Conference in Budapest, Hungary. 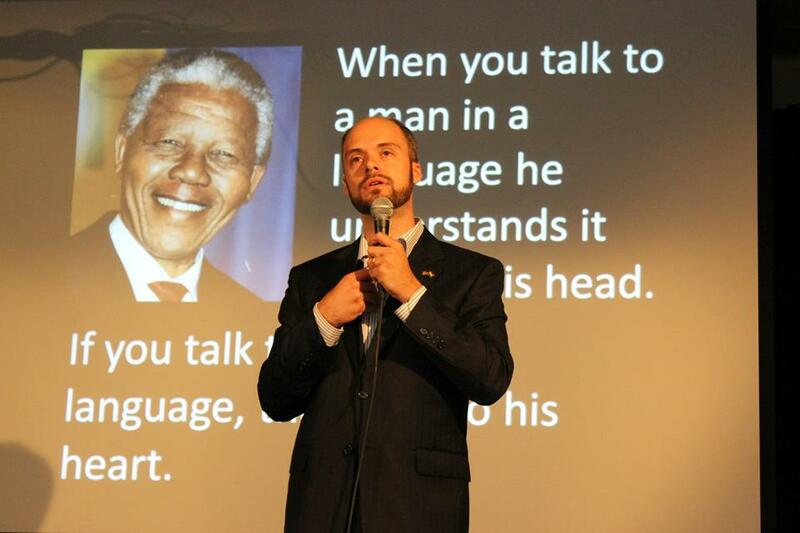 I spoke on why being a polyglot is an advantage in the field of conflict management. At the end of my presentation I used the words of a polyglot peacemaker (Nelson Mandela) to sum-up why more polyglots should look into the field of conflict management: When you talk to a man in a language he understands that goes to his head. If you talk to him in his language, that goes to his heart. My studies and subsequent career change into conflict management have been the main things keeping me from posting here regularly. Since then Richard has been highlighted in the news in several countries, both on TV and in written articles. If you’ve seen the video you know exactly why. This video also got him voted, by the public, as the ambassador of multilingualism in an EU conference on multilingualism. When Richard published a video of a panel discussion from this conference I was surprised by something. What the heck was Luca Lampariello doing on the panel? Don’t get me wrong. I have immense respect for Luca’s abilities. I was merely surprised because I was unaware that he would be participating, other than as a conference attendee. Not surprisingly, Luca’s insights in the discussion were great; it would have been a shame if he hadn’t participated. All the while I couldn’t avoid the suspicion that Richard had somehow been influential in getting Luca up there. I later had this suspicion confirmed. This is merely one example of what Richard has done with his expert authority, he has combined it with moral authority. Instead of using it for self-aggrandizement, Richard has used his authority to point us all in the direction of many other fabulous polyglots, Luca being only one of them. In this video (taken during the Polyglot Conference in Budapest), who is leading the charge, sounding the trumpet that Emanuele’s abilities are noteworthy? It’s Luca. From what I can see, Luca is following Richard’s example in combining his expert authority with moral authority. Instead of figuratively trying to keep all the pie for himself, Luca makes the pie bigger so that there is more than enough for everyone he interacts with. 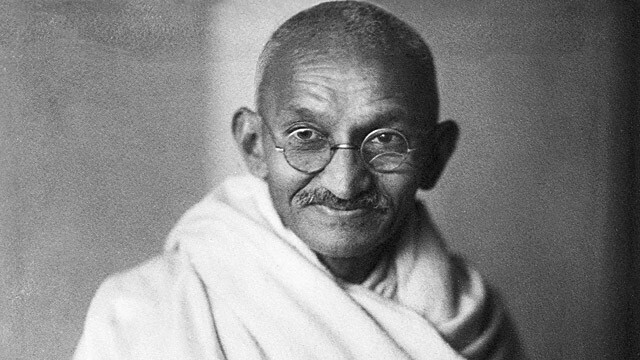 Mohandas Gandhi is considered the father of history’s largest democracy: India. Who elected Gandhi to his position? What made Gandhi an expert in non-violent resistance and nation building? The answers are no one and and nothing. All the same Gandhi was able to mobilize Indians from all social classes and religions. What Gandhi had was moral authority. This kind of authority has an infections, synergistic impact with a wide ripple effect. Since the video of Emanuele has gone viral (over 300 thousand views in a little over a week), Emanuele and Luca have made another video. Since thousands of the viewers of the first video were from Poland, this second video that Luca and Emanuele just made is subtitled in both English and Polish. I imagine that Michal Grzeskowiak was instrumental in making this happen. Emanuele is not the only person to have been changed by the Polyglot Conference in Budapest. Ask anyone who attended and that person will tell you how unforgettable the experience was. Notable and charismatic figures from the online language community (such as David Mansaray, Benny Lewis and Susanna Zaraysky) appear more pumped than ever. In fact, many people, such as Brian Kwong, are spontaneously and independently stepping up to add a whole new and fabulous dimension to the online language learning community. Those of us who participate in this great community are fortunate to have such great leadership. They are great leaders who inspire other people to also be great leaders. Thanks for this interesting, informative blog post. One of the things I love about Luca and Richard is that they willingly share their knowledge and help those of all levels who are genuinely interested in learning languages. Richard and Luca help to establish a polyglot community instead of a polyglot competition. What a nice post Ryan, thank you for sharing, and so true about Richard and Luca. I would also like to wish you all the best with your career change, not an easy thing to do, but it sounds very interesting indeed.